Earphones fresh in from Germany - can they compete with the big brands? Can the Teufel Aureol Groove's compete with the well-established brands? Chances are you've come to this review because you're looking for some new earphones to replace those awful, white, tinny ones you got with your iPod. Are we right? Or are we right? It really is a mystery why Apple still insists on shipping those awful plastic earbuds with its otherwise super-high end products, but there you go. While the truly high-end earphones out there can cost close to £400, you'll be pleased to hear that you can pick up some very accomplished ones for well under a hundred quid. Indeed, you only need to spend around a fiver to pick up a pair of earphones that far outclass those bundled iPod ones. So the question is – who do you give your money to? Teufel is a German brand which is fairly new to the UK, and its products are only available online from the Teufel website. The Teuful Aureol Grooves can be picked up from said website for £59, which given the unrivalled awfulness of Apple's bundled earbuds, has become a hugely competitive area of the earphone market. The trick is to build a great sounding product, that doesn't cost the earth and can be priced aggressively enough to get you a slice of the pie, while still making a decent profit. It's much harder than it sounds. And sadly, we have to report that the Teufel Aureol Grooves don't quite have what it takes. They look good, and come with three sets of silicon buds to cater for all the big, medium and small-sized ear canals out there, as well as a sturdy carry case. A good start then, but to get by in this market, you have to get the price/performance balance exactly right, and it's here that Teufel falls short. The earphones themselves aren't awful by any means. Compared to the afore-bashed iPod buds, they're a huge step up. 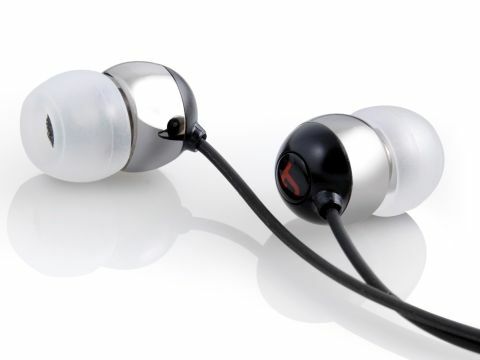 The silicon cups create a nice seal in your ear, and the noise isolating effect is on a par with most of the other earphones you'll find at this price point. But acoustic performance is mostly disappointing. For our liking, they favour the low-end far too much. The bass is very deep, but lacks any kind of definition, which results in muddy, muffled performance. The high-end lacks depth too, and you notice that most when listening to music. Acoustic guitars, cymbal crashes, snare drum beats – they lack the life-like vibrance and clarity of other earphones in this category. It's a bit like reading in the dark. Of course, in a world where £180 earphones like the excellent Shure SE420's exist, a £69 pair from a small company is never going to set the world on fire. But the problem is that there are other earphones out there, that cost about the same, that are just... better. The Shure SE115's spring to mind. We also find the units themselves to be a bit too small. While it's good to have a compact product which sits subtly in your ear, you also need to be able to grip them well enough to fit them properly. They're so small though, that we struggled to get them in. They're just a bit too fiddly. So all in all then, the Teufel Aureol Grooves are a bit of a disappointment. They lack bite, and struggle to make a case for themselves. If they'd been priced closer to the £20 mark, we'd have been a whole lot more impressed. But the fact is that the £60 pricepoint is in an overpopulated part of the audio ocean, full of superior products from the likes of Philips, Sennheiser and Shure. These Teufels are just a bit out of their league.